Piranha-Bertsch bending rolls are designed and built to accurately form metal from gauge thickness through 14″ thick and larger, and can be custom designed to meet specific applications. Bertsch was founded in 1879, and has earned worldwide recognition as the leader in the manufacturing of innovative, heavy-duty metal rolling equipment. Bertsch has been a Piranha brand since 2003, and today, Bertsch users enjoy the advantages of Piranha’s exceptional support. Explore more benefits of Piranha-Bertsch Bending Rolls. Explore some of Piranha-Bertsch plate roll features and benefits. Pre-bending to the full rated capacity plate is accomplished with sufficient power in each side roll hydraulic cylinder. Many competitors are not capable of pre-bending to their maximum rated rolling capacity. Rolls are easily adjusted on either end with Bertsch’s unique electronic leveling system. 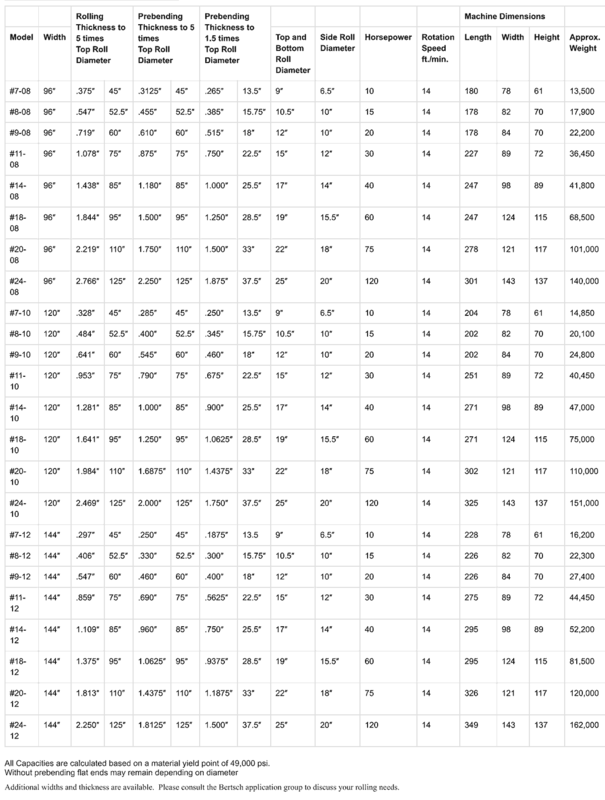 Because most competitors allow adjustment on one end only, roll corrections are more difficult. Recommended when rolling larger diameters. Hydraulically adjustable and used to maintain cylinder shape during rolling. The attachment is a removable snubber device, designed to retard the small end of the cone, allowing the large end to travel at a greater surface speed. Recommended when forming cones or when rolling hard materials that may leave permanent scarring in the roll surface. Custom designed for rolling application to reduce labor. Linear encoder measures plate travel, as a digital readout indicates plate location. Used when rolling parts requiring a flat prior to a radius. Infinitely variable roll rotation speed provided directly from operations console. For applications where surface is critical and minimal defects are allowed. Custom designs to fit every rolling need — from rolling corrugated material to automated cells. Custom Piranha-Bertsch rolls are built to handle the most severe applications. Rectilinear Guides and Electronic Roll Leveling are foundations of Piranha-Bertsch’s reputation for long-lasting heavy-duty rolls. Piranha-Bertsch rolls are capable of rolling to 1.1 times top roll diameter. All Piranha-Bertsch rolls can pre-bend at rated rolling capacity. Operator controls are located on movable pendant or console for ease of use. Piranha-Bertsch offers a range of control units—from manual/digital readout consoles to an NC Control console. Programs can be created by editing individual blocks or by inserting actual roll positions by using the teach functionality as you roll. A blended radius can be programmed by programming two axes in one block. A comments section is displayed so that the operator can make notes about the job to help verify the program at a later date. Note: The NC Control is designed to manage the machines axes. How material reacts to these positions can vary greatly with changes in the materials dimensions and mechanical properties. Therefore, modifications to program positions are often required to adjust for these variables. Four digital readouts, one for each side roll and two for pinch roll. Pressure gauges monitor pinch pressure on both ends of the machine to monitor part squareness. Operator safety is ensured by electrical disconnect with lock-out feature, e-stop button located on control, and a trip switch located along both sides of the machine. Spherical roller bearings increase drive’s efficiency by reducing friction. We reduce potential leaks by eliminating connections and utilizing hard tubing throughout the machine, limiting the use of hoses only to areas requiring a flexible connection. Most competitors use hose connections exclusively, creating the potential for more leaks. The Rectilinear Guide concept consists of forming rolls that are guided in place by a machined surface, and bearing blocks mounted directly above the hydraulic cylinder. The position of the rolls is controlled by the hydraulic cylinder with no additional moving parts. Piranha-Bertsch’s Rectilinear Guide system transmits the forming roll forces directly to the hydraulic cylinder, into the machine frame, and into the foundation. There are no load-bearing wear points or torsional stresses affecting roll parallelism and accuracy. This leads to a long service life, consistent parts, and low maintenance. 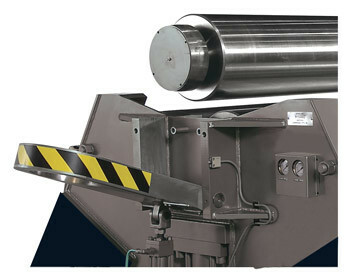 The centerline of the forming roll is close to that of the pinch roll. This allows the flat areas associated with pre-bending to be small and consistent. In addition, Piranha-Bertsch sizes the direct-acting hydraulic cylinders to pre-bend to the maximum rolling capacity of each machine. Each side of every forming roll is individually controlled, allowing fine roll adjustments, making cone rolling easy to set up. There are no torque tube stresses to account for. Rectilinear Guides are more expensive to produce because they require additional machining, and the hydraulic cylinders have a larger diameter. The Planetary Swing Guide concept consists of the forming rolls mounted to a lever arm. The hydraulic cylinders are mounted so that a mechanical advantage is formed allowing use of a smaller diameter, and less expensive cylinder. The rolls move along an arc, and are cam guided. A torque tube is mounted between the hinge end and gear end of the machine, and attached to the levers in order to maintain parallelism of the rolls. This concept requires smaller cylinders and less machining than the rectilinear guides, and therefore costs less. Each side of every forming roll requires a minimum of four pivot points. These pivot points consist of a pin and a bearing. The entire bending load of the machine is translated through these pins and bearings resulting in faster wear. This wear creates loss of parallelism and therefore difficulty in maintaining consistency from part to part. The centerline of the pinch and forming rolls are larger than on rectilinear machines. As a result, the flat associated with pre-bending is larger, creating more part inconsistencies. The amount of mechanical advantage becomes limited as the forming cylinder rises for pre-bending. The cylinders are typically not sized to handle this additional force, therefore the machines are not capable of pre-bending the material to its nominal rolling capacity. The torque tube is sized in order to allow some twist for the purpose of cone rolling. The torque tube is not capable of keeping the rolls parallel. 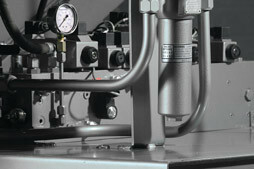 The torque tube creates twisting stresses in the lever and machine frame. Variable speed differential achieved by the Independently Driven Top and Bottom Rolls, allowing them to seek their own speed when driving on the inner and outer radius. Some competitors offer inferior gear-to-gear or chain drive systems, limiting them to fixed speed differentials. Hydraulic cylinder actuates the automatic self-locking hinge. Customized crowned roll forgings adaptable to your specific rolling needs. Piranha-Bertsch plate rolls are built to last … but even the heaviest, most solid machines benefit from a check-up and an update every now and then. During an MPA (Machine Performance Audit), a trained Piranha-Bertsch technician inspects your machine and provides a road map to increasing and maintaining your accuracy and productivity. You will receive a written report detailing maintenance or repair recommendations, required parts, and an estimate of hours to complete the work. 10% discount on replacement or repair parts. 20% discount from current service rates on additional days labor. Many of our earlier mechanical plate bending machines are equipped with the slip ring type motor to provide plate feeding power, and this was controlled by a manual reversing drum controller operating in conjunction with grid resistors to the secondary circuit of the slip ring motor. This drum controller was always an expensive item to maintain and it has now also become expensive to replace. Recent federal, state, local electrical and OSHA codes usually require reduced voltage control circuits, which were not possible with the earlier style drum controller which used full line voltage for operation. In view of the above, we have developed and can furnish for any of our machines equipped with the manual drum controller a “tri-speed” electrical control package. This controller will eliminate the full voltage manual drum controller, and has been designed to replace the electrical control items for the earlier machines. 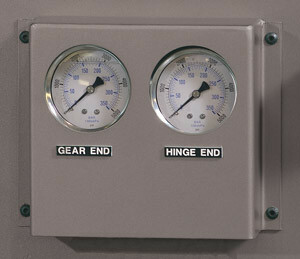 In the “tri-speed” control package, all controls are rewired and mounted in a single NEMA-12 enclosure. This NEMA-12 cabinet is bolted to a platform designed to mount on the front side of your machine at the drive end. The platform also provides adequate guarded space below in NEMA-12 cabinet to mount the necessary grid resistors. The package also includes a simplified operator’s control console, conveniently attached to the NEMA-12 cabinet. The console incorporates a rugged spring-centered safety “joy stick” operating at reduced voltage, and for controlling the “forward-neutral-reverse” roll feeding action. For maximum safety to the machine operator, the plate feeding action is a two handed operation, which requires both hands on the control desk during rotation of the roll forgings. The “tri-speed” control package utilizes the existing wound rotor, main drive motor and grid resistors. If the present main drive motor is not equipped with a brake, then the correct size brake must be added in order for the complete machine to meet current safety standards. If a brake cannot be added to your present main drive, wound rotor motor, then it will be necessary for you to purchase a new main drive motor complete with the proper brake. The prices now quoted only include out “tri-speed” control package, but we can also furnish assistance toward equipping the machine with the necessary brake on the main drive, wound rotor motor. Please contact us for further information if this type of assistance is required. In order for any machine to pass current safety requirements, it is also necessary to install around the entire nip point area some type of device to allow anyone in this area to stop the machine quickly. In view of this, we also offer with our new “tri-speed” control package our safety or emergency “stop” kit. Manual, fused disconnect with lock-feature. 110 volt control transformer and separately fused and grounded control circuit. Reversing starter for the main drive plate feeding motor with thermal protection. Two additional contractors providing the second and third speed points of the main drive motor-grid resistor speed control system. Main drive motor brake control circuit. Reversing starter for the rear roll adjusting motor with thermal overload protection. Combination push-to-stop, pull-to-start mushroom switch. Special spring return to stop “joy-stick” switch for the main drive plate feeding system having three speed points “forward” and three speed points “reverse”. Vertically mounted safety mushroom switch which must be depressed (simultaneously with the operation of the main drive) this requiring two hand operation to run the main drive motor..
Spring return to stop “joy-stick” switch for “up-down” control of the rear roll. Optional (two) spring return to stop “joy-stick” switches for “up-down” control of the lower front roll power wedge motors. Duplicate copies of electrical wiring diagrams and electrical replacement parts number. Two (front and rear) emergency “stop” switches, guides, and cable. Duplicate safety warning plates of durable metal. Do You Need a Plate Rolling Expert? We teach the art of rolling on Pirnha-Bertsch rolls. Our hands-on trainer has 30 years rolling experience to help you improve your productivity and part quality. Contact us for a quote on your roll training needs. Unbeatable quality at an affordable price. That’s Piranha. 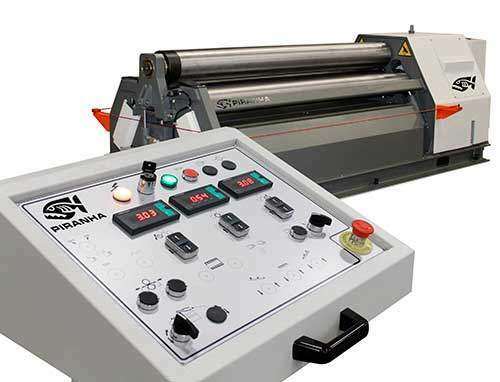 Piranha-Bertsch offers a complete line of hydraulic bending rolls: four-roll double pinch, three-roll initial pinch, and the three-roll double pinch. Easiest machine to operate since material is clamped during the squaring process and held during the entire rolling process. Able to pre-bend, roll and post-bend the entire piece without releasing the pinch, allowing some parts to be pre-bent and the entire cylinder rolled in a single pass. Because the plate is clamped through the entire bending cycle, a rotary encoder can be utilized to indicate how much plate has been fed through the machine, allowing it to be fitted with an optional CNC control. Material is fed into the machine parallel to the floor, easily fitted with feed tables and side supports, or placed into a pit for ease of operation. Less floor space is required because the part is rolled up and over right after the first pre-bend. Machine can be fed from either direction. Ability to pre-bend material to minimize flat. Able to bump form easily. Requires less floor space than three roll double pinch (both ends of the plate are preformed from the same side of the machine). Able to square plate prior to rolling. Machine can be easily fitted with feed tables, material supports, or set in a pit. Material remains square throughout the entire rolling process once it is squared and pinched between the pinching rolls. May require operator to remove plate from machine and rotate 180 degrees to pre-bend trailing edge of plate if the part requires pre-bending on both ends. This style machine is able to pre-bend both ends and roll the plate by feeding the material only once. Eliminates the need to flip the plate around. Allows for greater “rolling capacity” with the ability to spread the lower rolls apart which increases the centerline distance. Material is fed into the machine parallel to the floor, easily fitted with feed tables and side supports. Horizontally mounted lower roll cylinders allow for a lower plate entry height. The machine can be fed from either direction. Bertsch was founded in 1879 and has earned worldwide recognition as a leader in the manufacturing of innovative, heavy duty metal forming equipment. Bertsch became a member of the Piranha family in 2003. Even before the turn of the century, Bertsch built many designs and types of shears, press brakes, power rolls, punches, rivets and other equipment. As the industry progressed, Piranha-Bertsch research and development has used advanced technology for design innovations that meet today’s demands for quality, increased output and lower production costs. The first heavy plate roll for fabrication of offshore drilling jackets. Piranha-Bertsch experience guarantees reliability, our construction guarantees ruggedness, and our designs guarantee advanced technology today and into the future.